This year, Buffalonians will spend as much as $68 to see just one of the six distinguished speakers on North Campus. For the same speaker event, the average undergraduate student will pay a fraction of that cost, roughly the price of a McDonald’s coffee –– $1.06. The Spectrum calculated what the typical student pays for a number of UB events and services. This semester, students have paid roughly $38.3 million through UB’s nine broad-based fees. These payments support services such as football games and Student Association music fests. When the fees are allocated to events, students pay much less than what non-students might pay for them. Thousands of students take advantage of student-fee-supported activities, but many don’t and are shocked at the discount they get compared to UB visitors. Some students feel UB’s financial web is still too confusing, and that the university needs to better explain to students how their fees are used. The university hosts informational meetings, such as fee town halls, but they are not always well-attended. This October, only nine students attended a fee town hall meeting. That’s a problem for some who control UB fees, like SA Treasurer Tanahiry Escamilla, who said she wants students to learn more about how UB spends student money. UB’s nine broad-based fees also support services like the libraries services and parking. This semester, students have paid UB roughly $10.9 million and $6.1 million in technology and transportation fees, respectively. The average student has paid $1,215 in university fees this semester, according to Spectrum calculations. The Spectrum calculated the average fees by dividing the total student fee payments by the number of students, overall, this semester. Students submitted 1,376 waivers for six of the nine broad-based fees this semester, according to UB spokesperson Cory Nealon. Students can not waive the College Fee, Technology Fee and Transcript Fee, according to UB’s website. Students who want to waive the Student Activity Fee must contact their student government’s e-board, according to UB’s website. The number of students who waived the Student Association’s activity fee this fall isn't available until the end of the semester, according to Escamilla. The Spectrum’s averages for SA events do not account for students who waived the Student Activity Fee. Most students don’t waive their fees, and as a result, students pay less for a number of UB events compared to UB visitors, according to Spectrum calculations. The average undergraduate student paid $20.43 to SA for a ticket to all three Fall Fest concerts. If students wanted to see Fall Fest singer Ashanti outside of UB, a ticket to that show alone would cost them roughly $40 more than all three on-campus shows, according to Ticketmaster. Every year, SA pays the Office of University Events to sponsor the UB Distinguished Speakers Series. This fall, SA paid University Events $127,500 to sponsor the series. The typical undergraduate student will pay roughly $6 toward the sponsorship this year, according to Spectrum calculations. The average student has paid roughly $169 to UB Athletics this semester through the Athletics Fee, which is one of the nine broad-based fees. Undergraduate students don’t pay money at the door for games, but graduate students pay an additional $10 for men’s basketball and football games, as well as $5 for women’s basketball games. Rachel Millington, a sophomore exercise science major, said it’s definitely a deal to go to the speaker series and SA music fests. Jackie Britton, a junior health and human services major, said she’s shocked by The Spectrum’s calculations. In February and October, UB held informational meetings to explain how student fees are used across the university and to gain feedback from students. 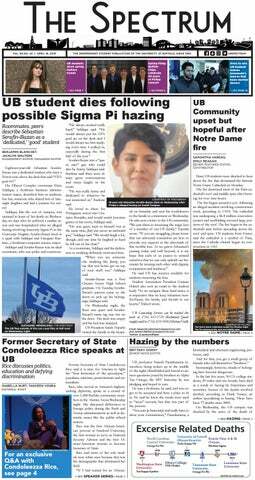 UB advertised the meetings in the Student Union, but only 54 students attended. Escamilla said she controls roughly $4.37 million this academic year. Of that money, roughly $3.87 million comes from student activity fees. All year long, SA club members ask Escamilla about their clubs’ budgets. But students who aren’t in clubs barely come to her office with questions, she said. Escamilla said she and other SA officials estimated that roughly 15 percent of SA’s budget goes toward clubs. Because of the lower percentage of SA’s budget dedicated toward clubs, Escamilla said she wants to see more students from outside of clubs come to her office in the SU. Going into this school year, Escamilla said SA’s e-board wanted to make students aware of how SA is using their money. She said SA is reminding students about the fee on social media and reminded them during this past summer’s orientation. Escamilla said SA’s e-board wants to consider a program to inform students about SA’s budget. She said she recognizes UB’s efforts to educate students on broad-based fees. Last month, UB held an informational town hall meeting on broad-based fees. The Spectrum reported nine students attended the meeting, four of which were Escamilla, SA Chief of Staff Jacob Brown, SBI President Jennifer Schechter and a Spectrum reporter. A similar broad-based meeting in February attracted roughly 45 people. “UB really wants to receive feedback and they wanted students to be there. They made that very clear to me at the very beginning,” Escamilla said. Britton said she transferred to UB this semester and although she hasn’t gone to a fee meeting because she didn’t know about them, she’s interested in going to a future meeting. Escamilla said she has considered programming about SA’s budget, as well, as the last broad-based fee meeting made her more aware of how UB uses her own fees. Max Kalnitz contributed reporting to this story. Benjamin Blanchet is the senior features editor and can be reached benjamin.blanchet@ubspectrum.com and on Twitter @BenjaminUBSpec.